When it starts to get hot and stuffy in your room, you turn on the fan to circulate the air a bit. If you don’t own the space you’re living in, then you’re just happy there’s a fan at all. Of course, should the place you live in be your own, then you can choose to have anything from a wall-mounted fan like the ones at gas stations to a modern one that has LEDs and blasts Miley Cyrus as it spits paint on the walls. That fan hopefully doesn’t exist, but the Fanimation Ceiling Fan does, and it has all the modern looks and coolness you could want. 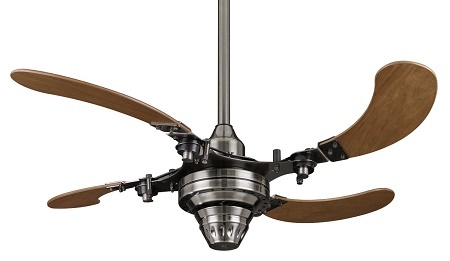 This has four cherry wood finished blades which can be retracted, 3 forward and 3 reverse speeds, and it will fit on ceilings that have a slope up to 30 degrees with a 43” blade sweep. There does seem to be a light you can install, but it will probably ruin the rustic-modern look this thing has going. This is only supposed to be used inside, and is sure to make any steampunk or robot-themed rooms look amazing. Of course, if you want this specific fan, you’ll be looking at around $225. You’ll also have to deal with installing it and not frying yourself setting up the electrical work. Of course, if this is going towards building your dream home then money isn’t really an issue, right?